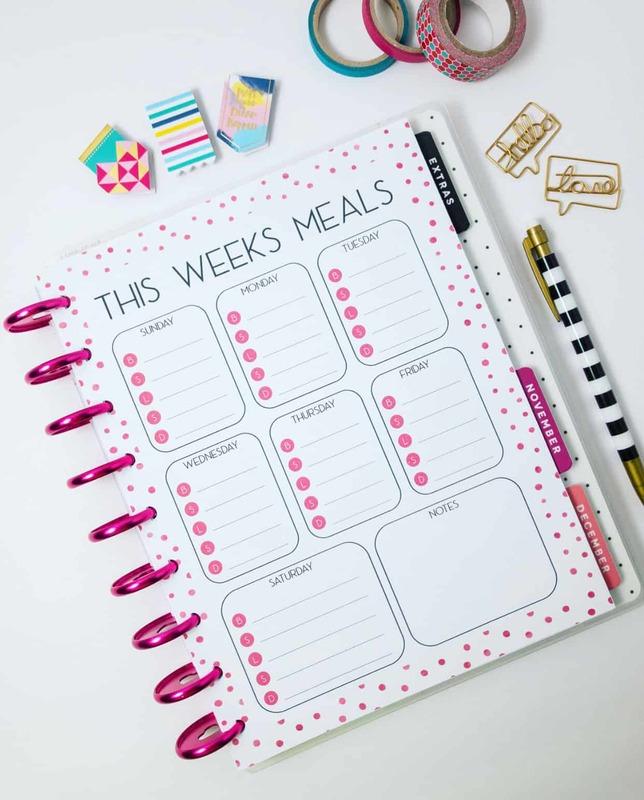 Unless you are a naturally organized person, keeping your home organized can be hard work! 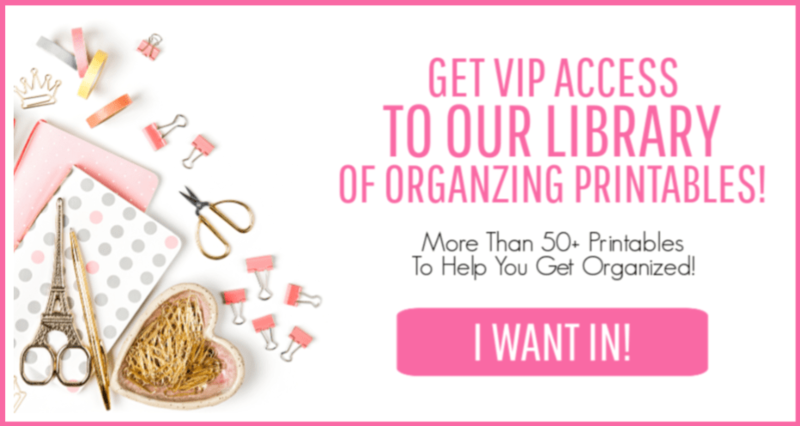 I am naturally organized but I still have trouble keeping our home organized while raising a family. That is why it is so important to have the right organizing systems in place! Investing in quality organization systems and taking the time to organize a space the right way can make all the difference in how long a space will stay organized! When trying to decide how to organize under the kitchen sink I did a little research first and found some great inspiration! You can read my favorite 15 genius ways to organize under the kitchen sink here! The amazing ideas I found from other bloggers gave me the inspiration to tackle organizing under my own kitchen sink. 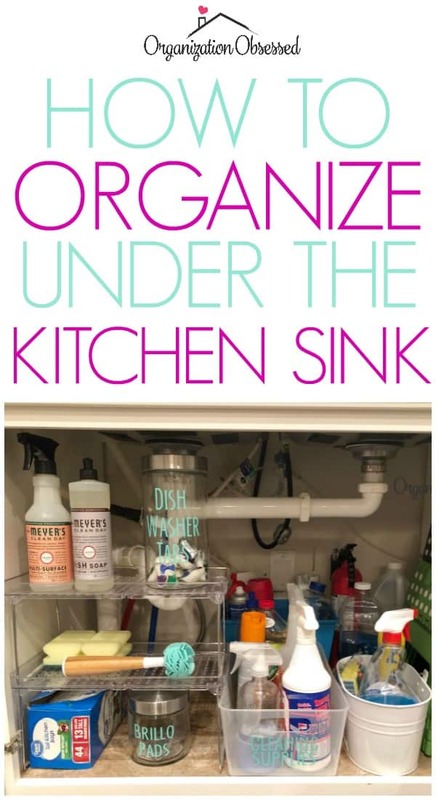 I had organized under our kitchen sink MANY times but nothing seemed to stick with my family. We had been using Dollar Store containers which was a great and cheap solution. But most of the time cleaning products never made it back to the right bin. There were no labels, so no one really knew where anything went and the containers would easily shift around. It was a mess! Below is how under the kitchen sink looked on a typical day. We had too many cleaners, too many bins and we could never find what we were looking for! 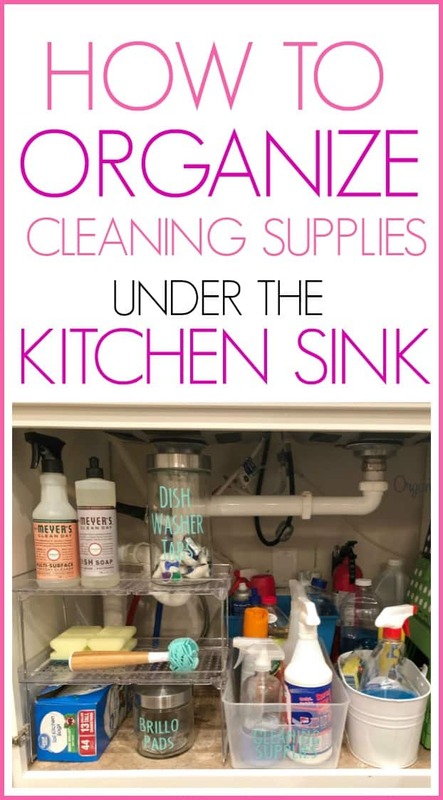 To start the process of organizing under the kitchen sink first pull out everything! Once your cabinet is empty, wipe down the bottom. When we first installed our kitchen cabinets I put down these peel and stick tiles under the kitchen sink. It protects my cabinet from any spills from cleaners or any leaks that may happen in the future. I highly recommend doing this! It is very simple and you can find peel and stick tiles at your local hardware store for less than one dollar a piece. I had less than $10 dollars in protecting the bottom of this cabinet. 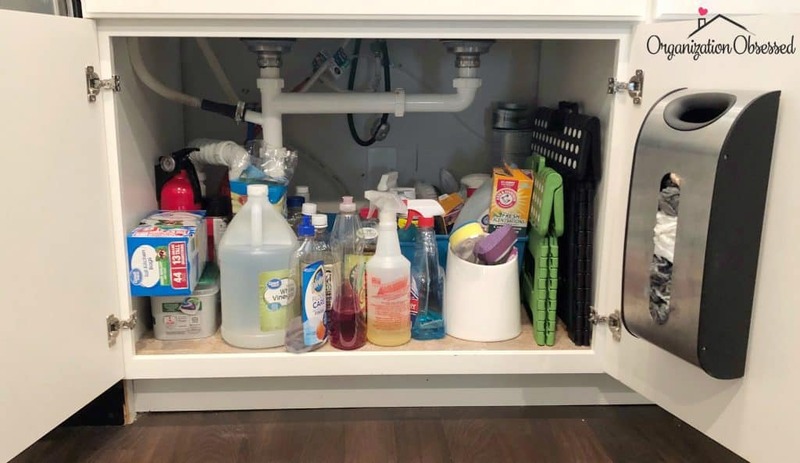 Before you start this project you will want to find containers and stacking systems that will fit well under your kitchen sink. Take measurements if you need to. I found stacking shelves for $9 dollars and a clear container for $12 dollars at Big Lots. I also found clear glass canisters at Big Lots for $3 a piece. It was a win! If you have a Big Lots go check them out! 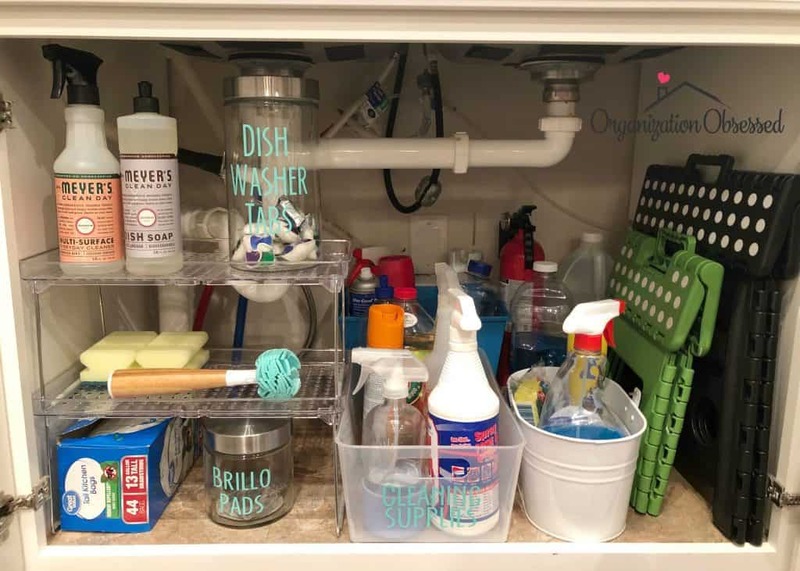 If not you can find some of my favorite under the kitchen sink organizers here! You can see I used stacking shelves to add more storage under the kitchen sink. 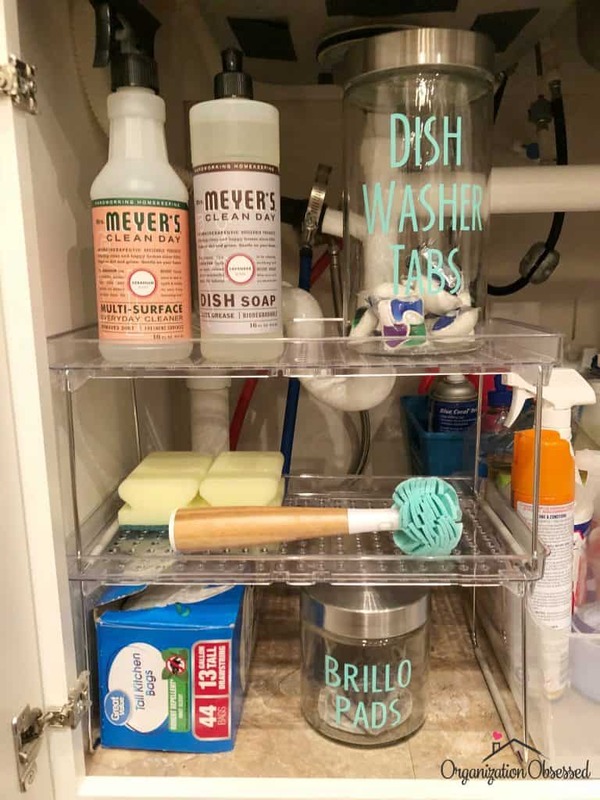 I used clear glass canisters to safely store dishwasher tabs and brillo pads. The glass canisters keep the dishwasher tabs dry and safe from children. Plus being able to label them makes it easy to know where everything goes and makes under the kitchen sink look even more organized! I am a firm believer that labels can make or break any organized space! The white metal storage basket is from Grove Collaborative. It was a freebie they gave me when signing up for their VIP Program! I love to order Mrs. Meyers hand soap and all-purpose cleaner from them but you can also find it on Amazon! The glass cleaning brush also came from Grove. However, if you are not a VIP member you can find it on Amazon as well! 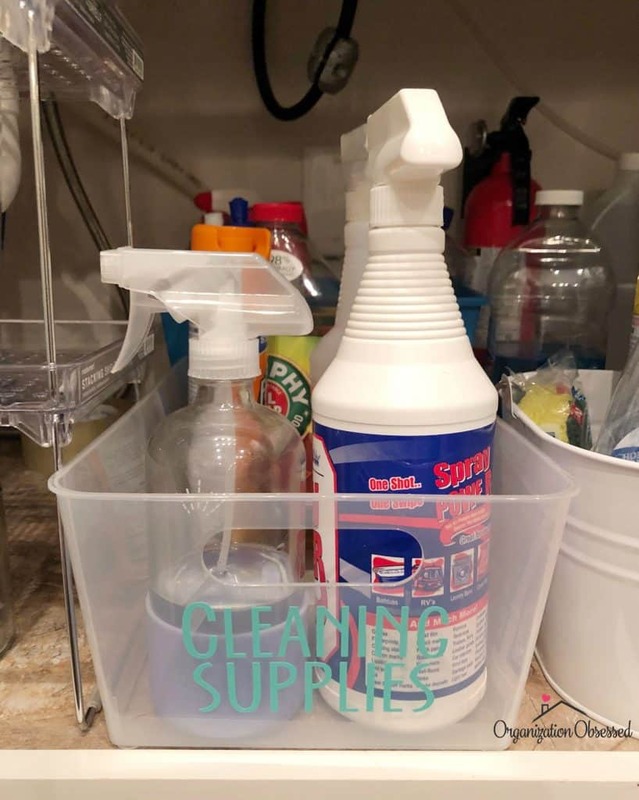 I also grabbed a long clear container to store all the cleaning supplies we regularly use. This one is from Big Lots but you can find a similar one here. I used my Silhouette Cameo to make the label. In this basket, we store white vinegar in a spray bottle used for cleaning purposes. We also store Crown Spray Power, Pledge, Murphys Oil, and Awesome All Purpose Cleaner. Behind the clear container is one of our old Dollar Store containers. In that container, I store things that we rarely use. It mostly holds my soap refill jug, Windex refill jug, insect killer, and Goo Gone. We also have a gallon of white vinegar and a fire extinguisher. Since I keep vinegar in a spray bottle I don’t have to pull out the gallon of vinegar very often. And thankfully we have never had to use the fire extinguisher! To make the labels I used my Silhouette Cameo. They are amazing to have. I am constantly using it to make labels. For these labels, I used Mint Oracle 651 and Crushed Font. Lastly, to store our grocery bags we use this grocery bag holder. We like to use grocery bags to take our lunch, so this holder makes it great to just grab one and go! I have had this mounted on my cabinet door for at least 3 years now and it has held up great! You can get one here! I believe it came with velcro to hold it on but it worked out better when we used the mounting screws. 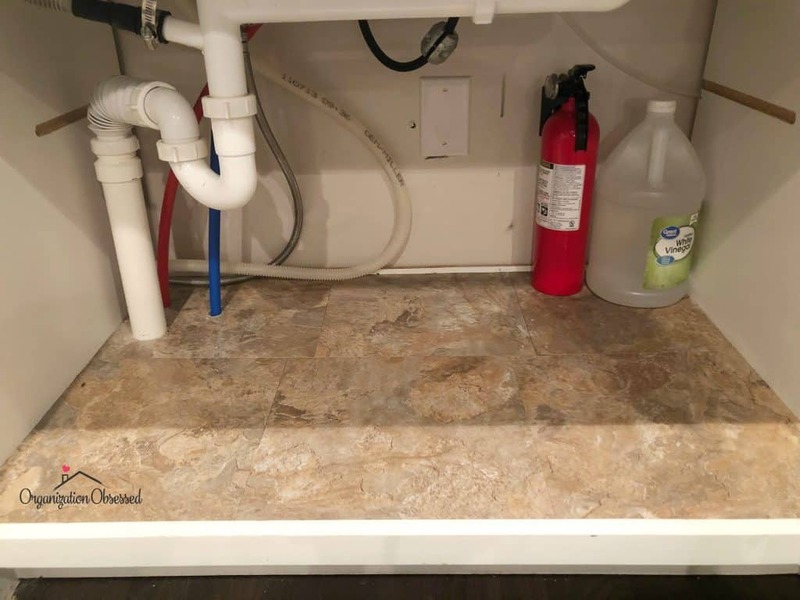 Under our kitchen sink has been organized for a few weeks now and it has been going great! Everything is still nice and neat in its place! All our cleaners end up back in the right bin and it keeps it very nice and tidy! 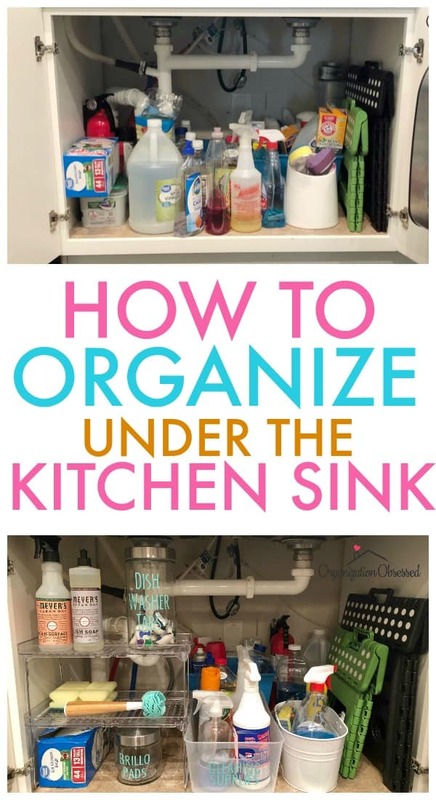 So how do you organize under your kitchen sink? Comment below and let me know! 5 Things You Need To Make Doing Dishes Easier! 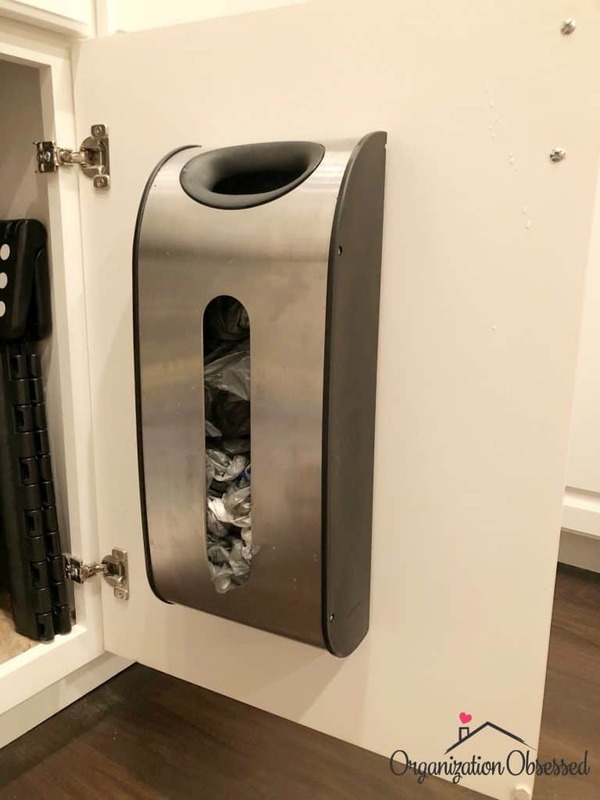 I have the same bag holder attached to the inside of my cabinet door under the sink, too! I ended up using Command strips! That’s great! It’s such a great way to store grocery bags right! We never even thought about using command strips! Such a great idea. Thank you!